Home visits for postpartum care can make all the difference to new parents. This year, ACOG—that’s the American College of Obstetricians and Gynecologists—came out with recommendations for optimizing postpartum care. There are lots of specifics, but the main takeaway is that new moms should get postpartum care sooner and more consistently than most do currently. That’s great news, of course. After decades of new moms not getting postpartum care until six weeks after birth (yes, a full six weeks!) and then only receiving one visit, we’re happy to see a change in the guidelines. However, members of the birth community have been providing this (and noting the need for ongoing medical care and support), since, well, forever. It’s ridiculous to expect new families to fend and care for themselves during the up, down and all around post-birth period, so official recommendations like this are useful and suggest an acknowledgment that our system has failed new parents. That’s why boober was created in the first place: to fill this huge gap in the support new parents receive during their baby-feeding journeys. When new parents receive early, supportive, in-person care, they are much more likely to not only meet their feeding goals but to experience a smoother and more positive transition to parenthood. “The weeks following birth are a critical period for a woman and her infant, setting the stage for long-term health and well-being,” the document explains. “To optimize the health of women and infants, postpartum care should become an ongoing process, rather than a single encounter, with services and support tailored to each woman’s individual needs.” Yes! It goes on to detail several important recommendations, including that a visit with a maternal care provider should happen within the first three weeks postpartum, as opposed to six weeks. It also highlights the importance of ongoing guidance on everything from the mother’s emotional well-being to infant care and feeding. Enter all the postpartum doulas, lactation consultants, and transition-to-parenthood therapists who have been supplementing our fractured healthcare system privately. Finally, the statement recommends that the “Obstetrician-gynecologists and other obstetric care providers should be at the forefront of policy efforts to enable all women to recover from birth and nurture their infants.” Yes, again! 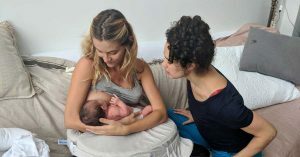 If the clinical care providers can be at the forefront of these major policy changes—which includes getting insurance companies to routinely recognize and pay for this critical support—we should be on our way to a better postpartum experience. In fact, let’s go a step further and let’s start making postpartum a whole lot better by listening to moms in the first place. This will be another whole post, but one of the top complaints from new moms during and after birth is that no one trusted or listened to their complaints. It’s one thing when it just contributes to feelings of depression or overwhelm, bad as that may be. It’s another thing when it may cost a life. We’re so thankful to Serena Williams who told her story and spoke out on behalf of all the new moms who couldn’t. Barbara DiCreddo receiving postpartum care from Lactation Consultant, Grace MacNair. While we’re happy that these common-sense recommendations have been formalized, questions remain about how they will actually get put into practice. Will obstetric practices start to routinely include multiple, early postpartum visits? Will these practices try to implement a home visiting system? Will they (and pediatric practices, for that matter) consider providing lactation consultants, pelvic floor therapists and mental health therapists on site? What about postpartum doulas who were not included the guidelines? Will insurance begin to cover all the complementary care that new parents need to make the transition to parenthood safer, easier and less complicated? Considering that ACOG itself noted that 25 percent of postpartum women did not even have a healthcare provider’s phone number to contact with concerns about themselves or their baby, we know the healthcare system has a long way to go reach the point where all new parents receive the postpartum support and information that they deserve. Perhaps ACOG should look to the many countries do a better job at providing this. In Holland, a healthcare worker called a kraamverzorgster will show up at a new mother’s house for up to eight days to make sure the baby is thriving, and assist with everything from weighing the infant, to making tea for the mother, to caring for older children. (Much of this is covered by health insurance.) Other places like Finland and Australia also offer generous, in-person postpartum assistance.